Use our Ladder Design Wizard to pick the ideal style for your application and to receive a full list of products suggested to build your Rolling Library Ladder! Build your own customized rolling ladder system! Safely reach the highest shelves in your library, wine cellar, workshop or other out-of-reach spaces while adding a classic look to your home. You'll find our prices are competitive and the quality of our hardware is unmatched. Use our Ladder Design Wizard to customize your own ladder system to your application and preference. After selecting your options and features, you will obtain a Bill of Materials that is your guide for ordering. Wood is not included (sold separately). 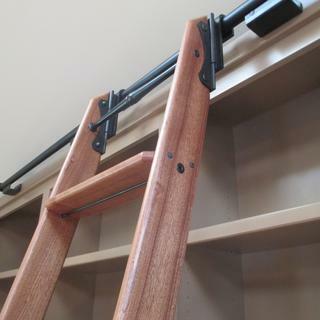 Durable 6' cut-to-fit Ladder Track provides a sturdy connection for your library ladder to your wall or bookcase using Track Brackets (sold separately). 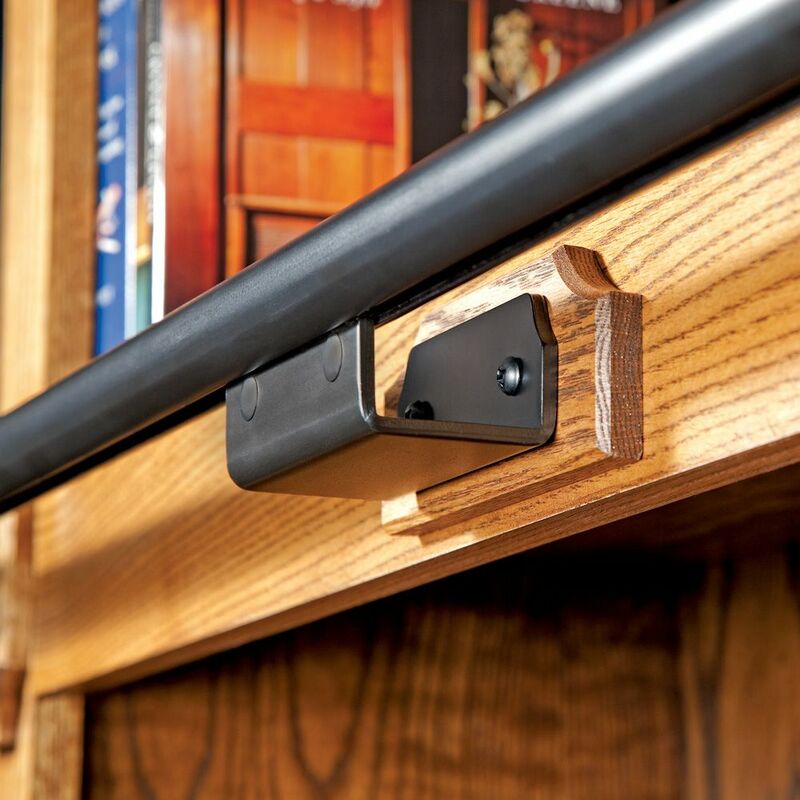 A narrow slot in the bottom side of the tube allows you to attach a Track Bracket without impeding the progress of the top-sliding library ladder. 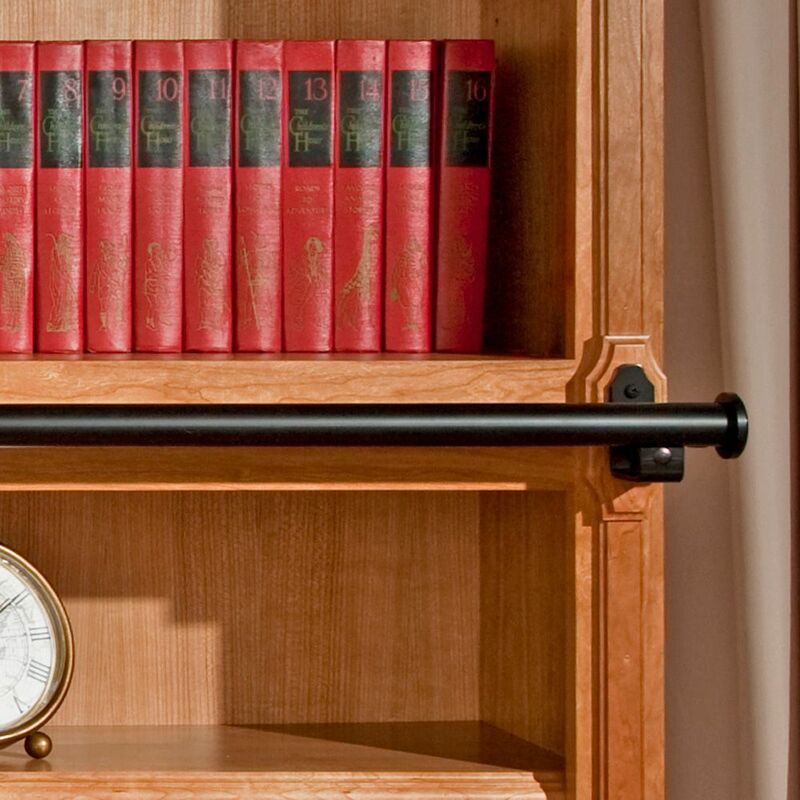 Use one 6' section or additional sections to span your entire library wall using our 5-1/2'' long Track Union (#42122, sold separately). 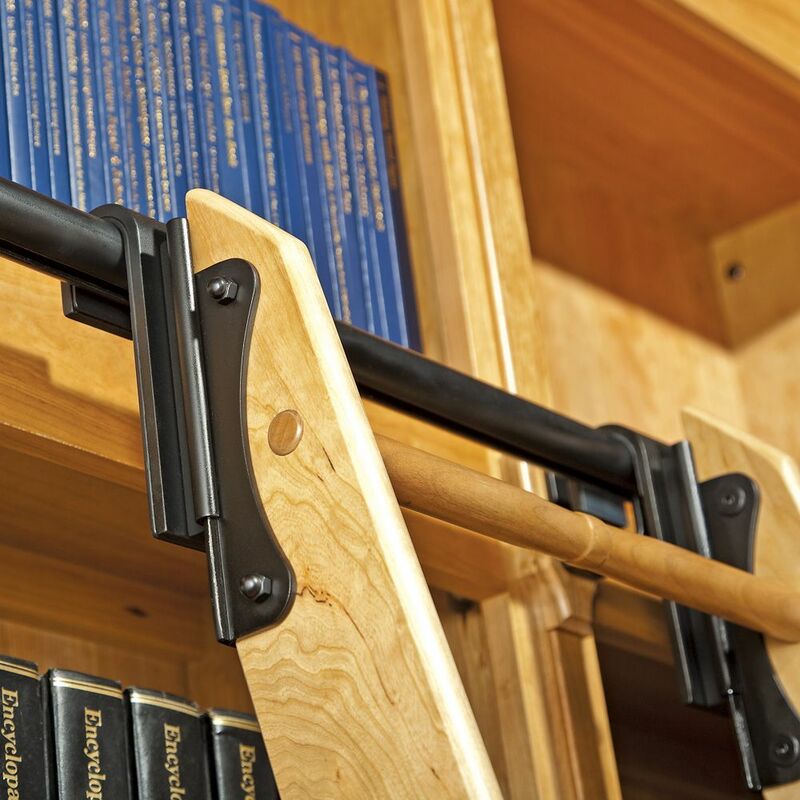 Provide maximum support for your Library Ladder Track (#42118, sold separately) with Vertical Track Brackets! 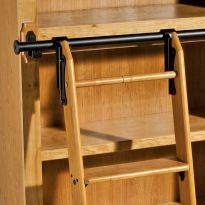 The innovative design slides inside the Library Ladder Track, providing a solid fit that won't wiggle, rattle, or allow any sagging. With the bracket inside the track, your ladder easily slides right over the brackets unimpeded. 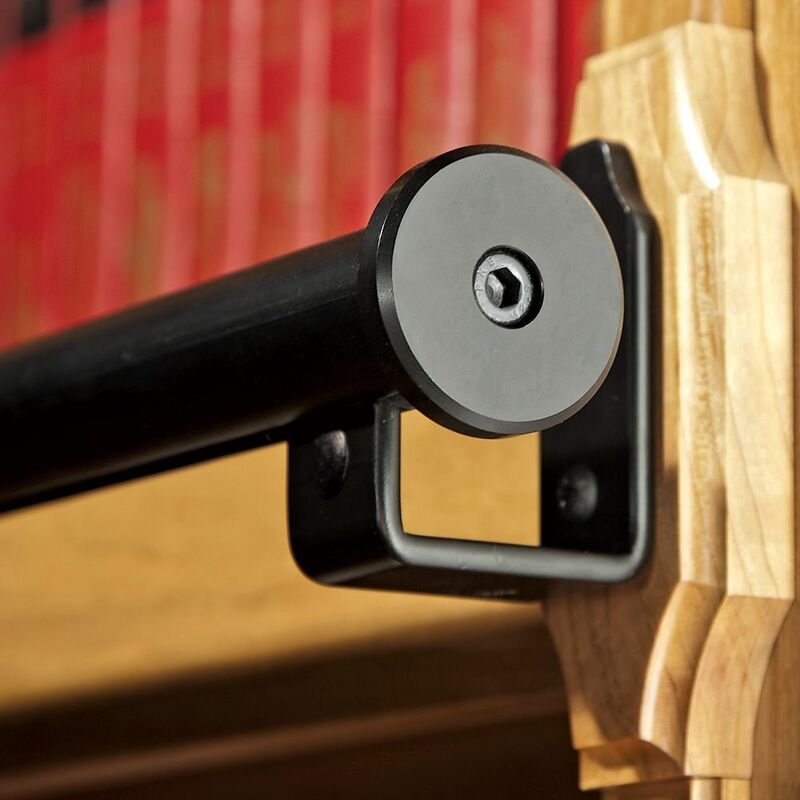 Premium satin black hardware completes the stylish look of your Library Ladder System. One Track Bracket is required for every 32-36'' of Ladder Track. 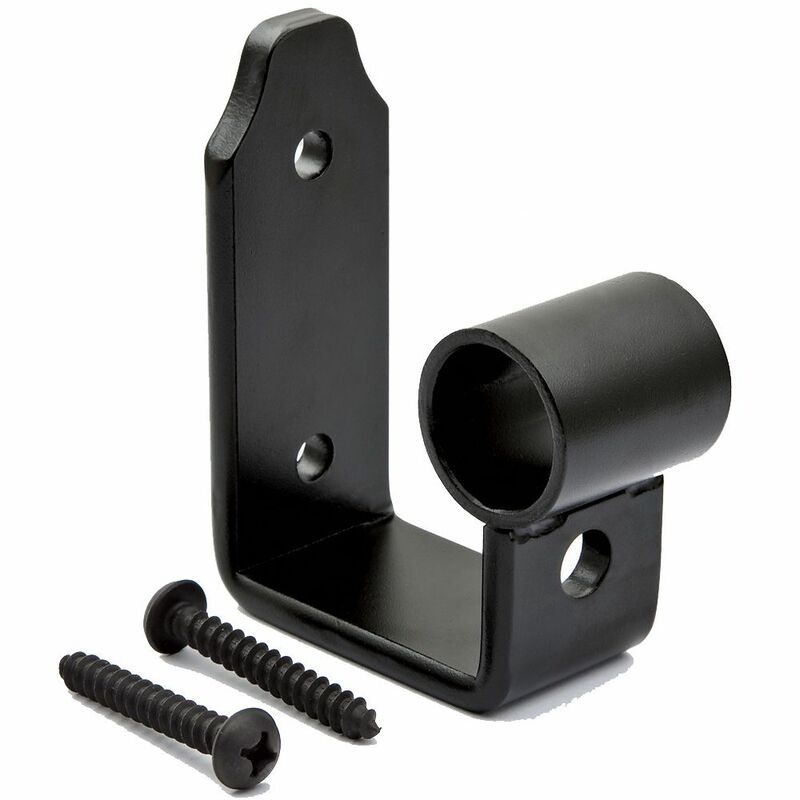 Vertical Mount track bracket which is 3-1/4" high x 1-1/4 wide. Vertical Mount track bracket projection: 2-1/4" from the wall to the center of the track. 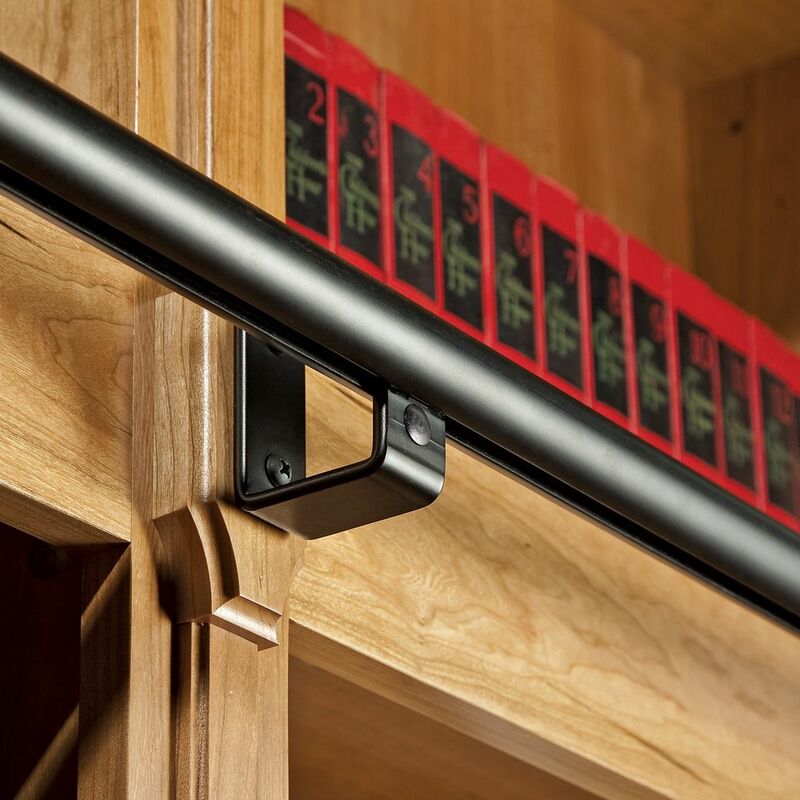 Shorter, horizontal orientation is ideal for cabinet rails and other horizontal mounting surfaces. Mounting plate measures 4"W x 1-3/4"H.
Use with matching Library Ladder Tracks (42118, sold separately). Includes mounting screws and plugs. 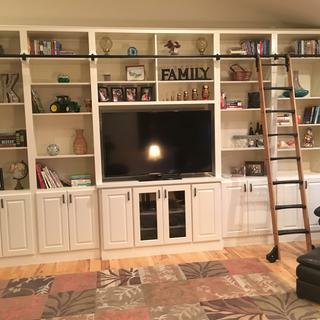 Projection is the same as our Vertical Ladder Track Brackets (#42120, sold separately). 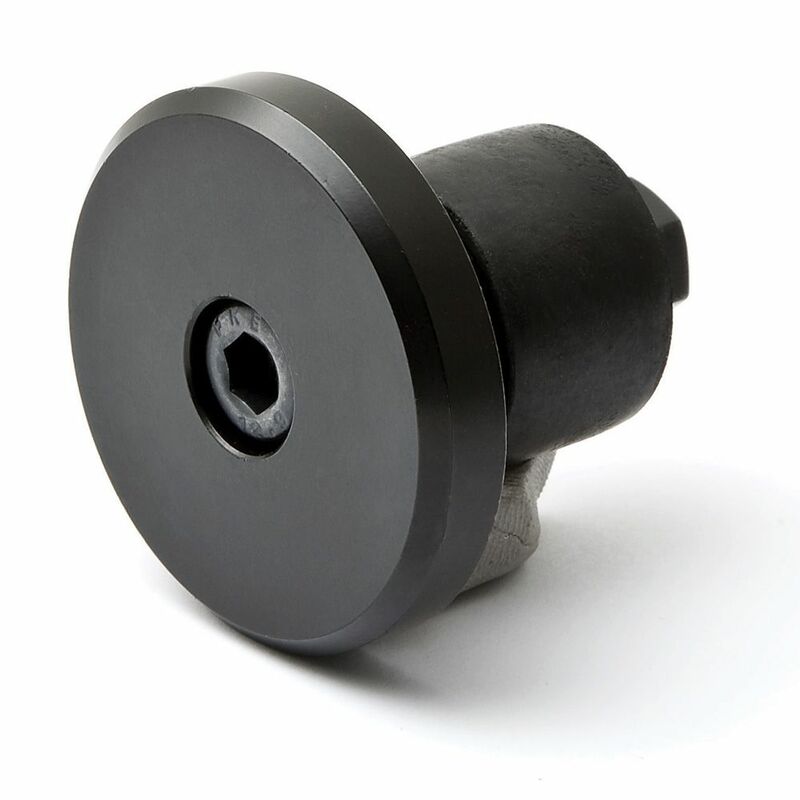 Sturdy 1/4" thick steel construction with coated finish. Connect two sections of Ladder Hardware Track (#42118, sold separately) to complete your Library Ladder System. Durable steel construction gives you a non-bending union you can trust. Sets up in minutes: simply insert each end of the Ladder Hardware Tracks you're connecting into the Track Union and tighten the set screws for a tight, non-slip fit. Includes set screws for a tight, non-slip fit. Prevent your ladder from sliding off its track with a Track End Cap. 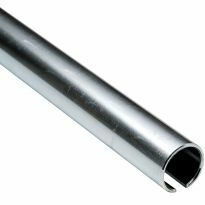 Attaches easily to the inside of the track tube and tightens for a solid fit using an included M6 hex wrench. Durable steel and aluminum construction. Straightforward to build, functional, well-designed, quite lovely. and we have had great outcomes. A perfect fit for our tall room! We ended up choosing the brushed nickel finish hardware instead. Looks amazing with our white built-in bookcase with window bench, and rustic industrial style remodel! Rockler was excellent to work with, and the ladder was easy to assemble. We would do it again for sure! 9’ ladder with 18’ of rail. LOVE! The ladder looks and works great. Very smooth action. You need to be very meticulous when drilling holes and laying out. There is no slop, hence a very sturdy ladder. I used a dowelling jig to line up the holes and keep them perpendicular to the rails. I checked the fit of the treads at each step. Even then I needed to use a round file to modify a couple of holes slightly in order to assemble the ladder. This could be a frustrating project if you are sloppy. Track assembled easily. Ladder rolls smoothly. 30 feet of track with 10 foot ladder works great! Just completed this 10 foot tall by 15 feet long unit for a friend of mine. The ladder that was used is the 10 foot. 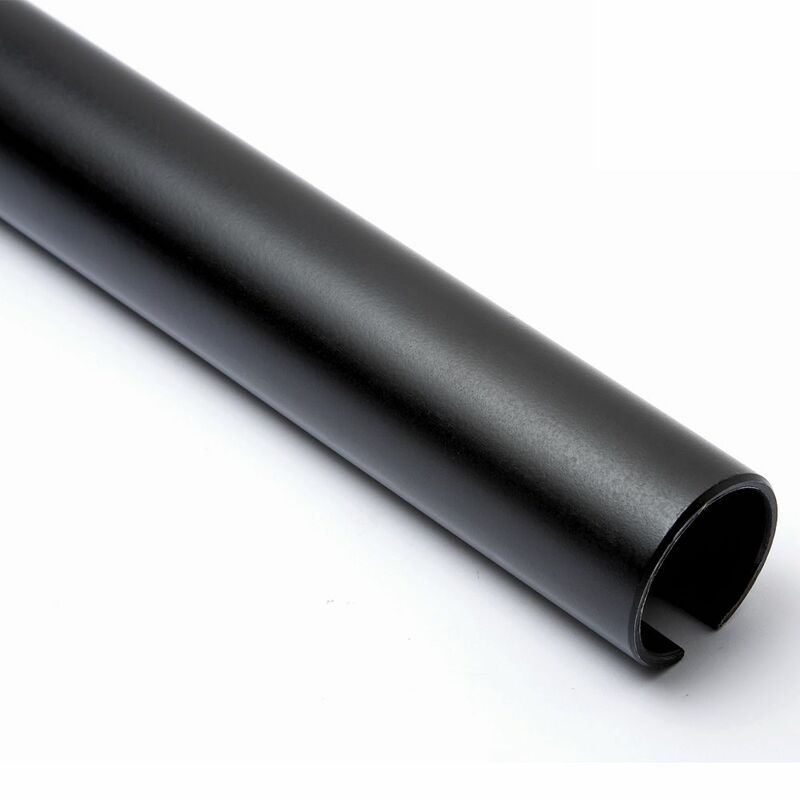 The quality of this product is excellent !!! It`s the BEST I have ever used !!! Great product! All parts were included and perfectly described for easy assembly. The side rail pieces were cut and sanded, ready for staining and sealing. Assembly instructions were simple and easily followed. 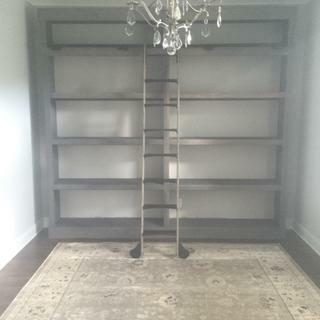 My bride couldn't be happier with her bookcase and library ladder. 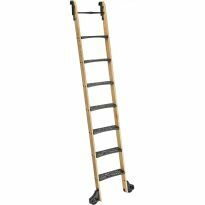 Tickler Vintage Rolling Library Ladder - 9 foot. Store in Milwaukee was extremely helpful! Did it myself, and was easy to install. Thanks! Love the character our new library ladder adds to our new library wall of our great room! The service and quality of the product were impeccable! 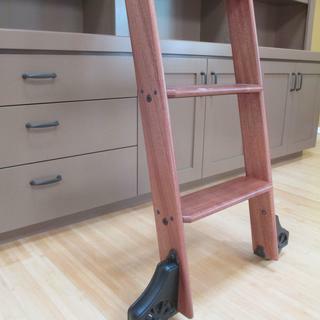 Thanks Rockler for your making such a beautiful ladder! The customer support is excellent. The quality of their products is also great! Absolutely love my vintage ladder kit. It was the perfect addition to my custom built 115" tall by 115" wide library shelving. 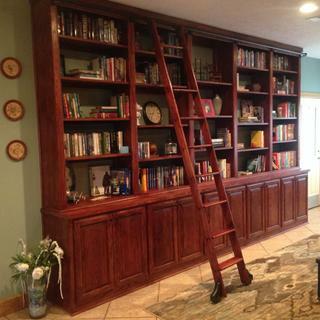 Custom built library using hardware from Rockler. Very pleased. 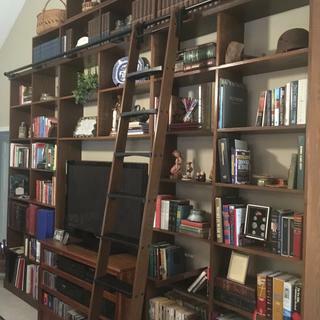 The ladder makes our full wall bookcase look great! It's solid and works well. One minor thing: How about a brake on the wheels? This is a very easy kit to assemble and create a library ladder system. 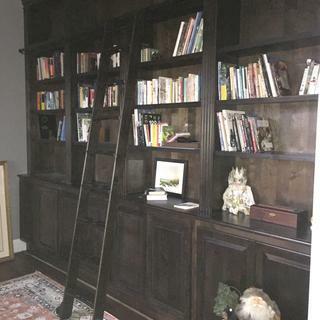 I have five separate rails ranging from 48" long up to 122" long in two adjoining rooms (mud room and pantry), with one ladder to go between all the rails. The instructions were easy to follow and the ladder turned out great. The only small drawback is the wheel system. It would be better if there was some kind of a braking system on it as it does roll a bit sideways depending on the climbing style of the person climbing it. I would give it 5 stars if it had that but overall I'm very pleased with everything. It came with12 feet of track. To match the black vintage metal steps. I will look great with the book shelves I built. 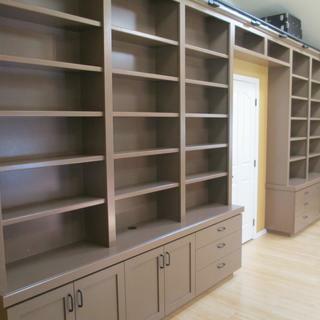 Classic look -- fun and practical with a 12 foot book case!! I like the black finish I felt it would hold up longer and it went well with the Knotty Alder I will be using it on. 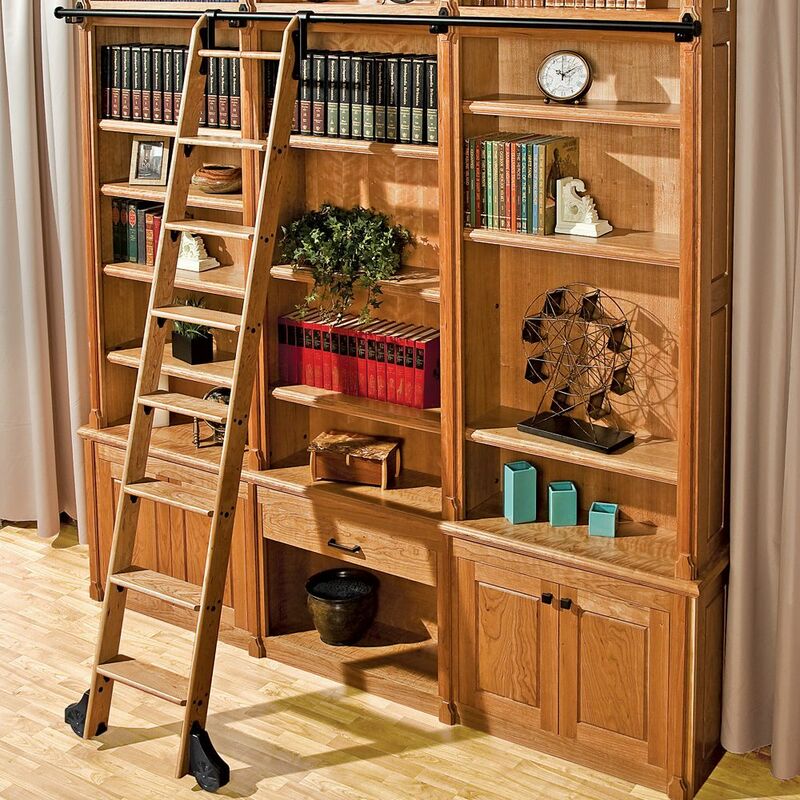 Having a library ladder adds a classic and classy element to your home. Having one in satin black only emphasizes this classic/y look. Super high quality products. Highly recommended! Easy access to upper storage in garage. The best ladder to suit our needs. We like the design and color. It was pretty. I downloaded the pdf instructions and was able to figure out all the parts I needed. Your ladder wizard was totally useless. It should be removed because it does not tell you all the parts you will need! Also, years ago I ordered your Murphy bed kit and was very pleased. Fits the style of my library bookcases. The black satin is very rich looking and will set off my entire room. Good reputation, best fit for my old house. Satin black and oak are perfect combo for my decor! Present for Daughter & Son in law they picked. Wanted this item for bunk bed access but wanted the ladder to roll out of the way when needed. Looks nice and I could get all the parts from one place. 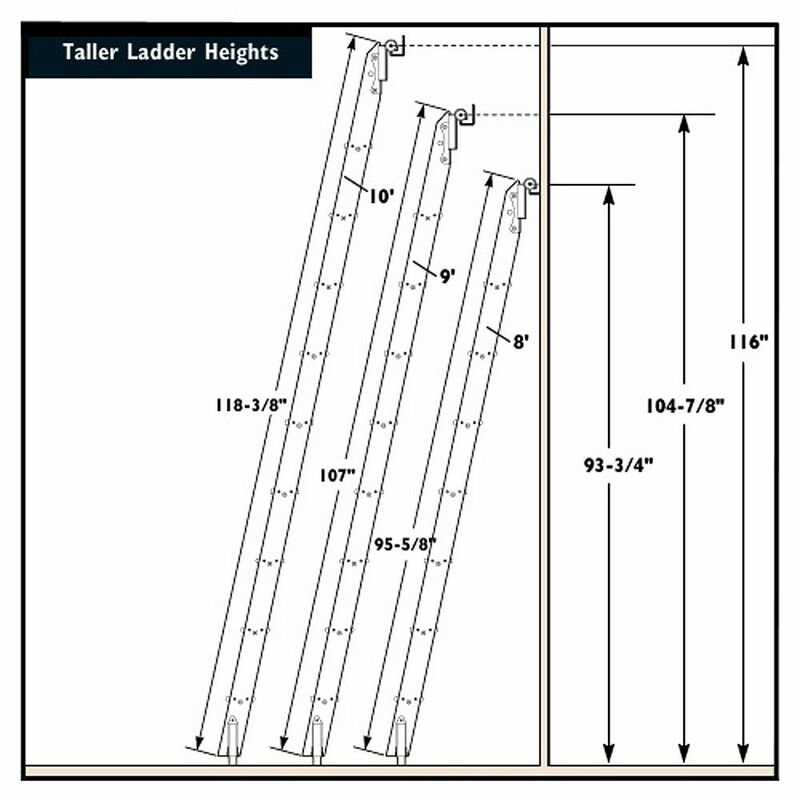 I am building a library ladder system and need the correct track to use the other parts I purchased from Rockler. I am not sure I can find a track that works from anyone else, so I ordered this separately in case I can't - to reserve them when they are available in sept. I would have purchased them with the other parts but they were "oversold". To finish up our library ladders. Can I get just a Roller for the bottom of the ladder? what is the diameter of the rail? BEST ANSWER: The rail is 1 1/4" outside diameter. Can you use two rails to make the ladder vertical? You do not need 2 rails. The hooks on the ladder slide up and down about 6" so that when you push the bottom of the ladder in to the vertical position the hooks are still engaged with the rail. Its a great system. Just make sure you mount the rail at the specified height. If you have manifactured the bottom rail for it to slide on also...then of course....so it would be fixed at the top and bottom by rails thus making the ladder vertical. I'm not sure I understand the question....the ladder is vertical and it glides along the the top bar. 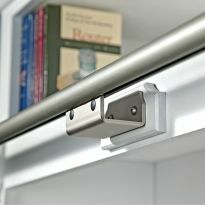 Does Rockler sell inside corners for these rail systems so the ladder can turn a corner? thanks! BEST ANSWER: We do not have corner rails for our library ladders at this time. “ Get Instant Access To Over 150 Wooden Table Plans Projects and Blueprints! ” Download 150 Table Plans Plus 16,000 Woodworking Plans With Step-By-Step Blueprints, Diagrams and Guides! We want to order the ladder kit but our study has shelves to the ceiling. However, there is a portion at about 3 ft height, that is wider to provide a desk area. What hardware can we get so that the ladder can be hung a 2-3 inches away from the shelfing so that the angle isn't as severe at the floor. Hoping that makes sense? 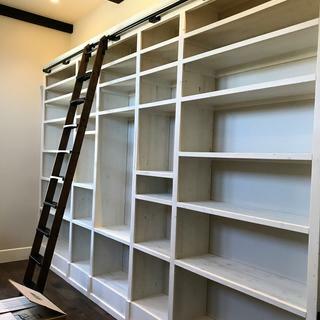 BEST ANSWER: Just to understand exactly what you want to do, are you trying to have the foot of the ladder be further away from the shelves to reduce how steep the ladder angle is (and to clear the desk part)? 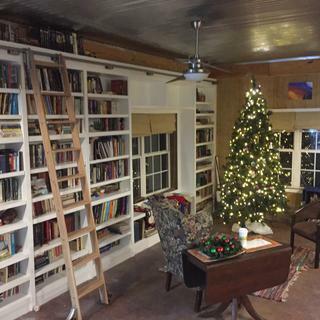 I just built the vintage library ladder and my shelves are also to the ceiling (10' height). With shelves all the way up, you just have to make sure you don't mount the brackets that hold the rail up against the ceiling or else the top of the ladder (attached to the hook apparatus that slides up and down to store the ladder flush with the shelves) will hit the ceiling. As far as reducing the angle that the ladder stands when you climb it, you can pretty much mount the hook apparatus to be in full out position with the ladder at whatever angle you'd like, you'd just have to do your own custom measurements (like I did since that area I had for mounting brackets didn't match any of the pre-measured number). You just want to keep in mind that as you increase the distance between the shelves and the foot of the ladder, the angle of the treads will also have to tilt to make sure they're parallel to the floor when in climbing position. Hope this helps.. The available hardware selection is limited to standard straight runs. On the library ladder systems that I've made, I've had to go to a local welding shop to have suitable pieces made or the pieces that come with the system altered to suit my application. We altered our mounting pieces to attach directly to our shelves rather than to columns in the middle. We made sure to only have everything mounted to studs and use extra fasteners. It worked beautifully. is the ladder pre-finished oak or raw? I think i only need 3-4 feet of rolling bar. Can you cut one smaller than 6'? BEST ANSWER: Yes you absolutely can just make sure you order the proper amount of end caps if the rolling bar is short of the wall. Yes the track can be cut. We cut at least a foot off. It works fine. Yes. It can easily be cut with a hack saw and will work just fine. Can easily be cut with a hacksaw, sawzall or cutoff saw. Yes. These can be cut to length. Curious. 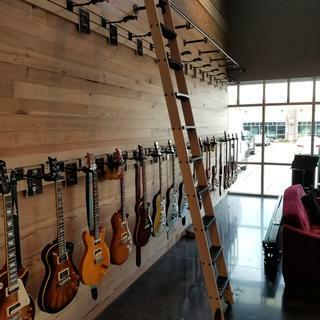 I want to use the ladders jn a room for a loft. However I also have a high window I would want to occasionally use the ladder to open. 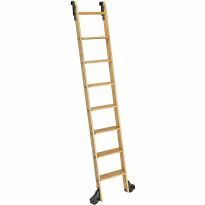 Are these ladders easily able to pull off the rails and reattached to the other for versatility use? BEST ANSWER: Yes. They can easily be lifted off one rail and positioned on another. I would not use this ladder as an auxiliary ladder. The wheels on the bottom don't come off and it would be very dangerous to use without the top rail attached. So your saying it would not be safe to attach and re - attach. But fine As a loft ladder if properly secured. Very easy Cory. Simply lift off and move it where you need it. how high is the bracket? I need to know in order to stack cabinetry to be certain the stiles are wide enough. BEST ANSWER: If you mean by bracket that supports the slider rod or bar.....i am not at the house for a week to measure...I mounted the support bracket and rod/bar at the mid span dimension of the sliding hook assembly that mounts at the top of the ladder stiles. This allows us to "stow" the ladder vertically by moving the bottom of the ladder up against the wall WITHOUT the sliding hooks at the top of the ladder to disengage with the bar. I had to , during installation, take a wag at the trigonometry to figure this out. I wasn't very clear. I need to know the size of the actual bracket that attaches to the cabinet. Height, depth, width...We are going to the ceiling with the cabinetry and we want the bracket to attach either to one of the cabinets (upper or lower) or to span the two cabinets where they "stack". hmmm less c here....there are 2 different Rockler stock brackets and i imagine yo u could find a spec sheet however. ....one bracket ' s mounting footprint is about 1 3/4 " by 4" and mounts horizontally with the 4" dimension ,horizontal. The other slider rod support bracket Is about 1 1/2 wide by about 2 3/4 tall. It mounts vertically with the 2 3/4 dimension, vertical. I would suggest footin' the bill to order one each to see. They have this product at my woodworking shop in Tukwilla Washington. (Ordered the ladder, rod or slider bar and metal steps from Rockler ) and bought some brackets from regular retail. Thank you. I wasn't very clear. I need to know the size of the actual bracket that attaches to the cabinet. Height, depth, width...We are going to the ceiling with the cabinetry and we want the bracket to attach either to one of the cabinets (upper or lower) or to span the two cabinets where they "stack". Wow. Sorry it has been two years since I built that library for my customer, so I can't remember how big the bracket is. I will say all my face frame one that unit were 3 1/2 wide and the brackets fit on them just fine. The horizontal catch bracket poll sits 92.5" off my floor. However, I have carpet so you would have to take that into account if bare floors. The bottom of my ladder/wheels sits about 21" from the wall. Just to clarify, the brackets that hold the horizontal bar are 1 1/4" wide and 3 1/2" height. do the casters have locks on them? I bought the library ladder to put in my cabin up north to get to a sleeping loft. And, frankly, I don't remember if there are locks or not because....it would be a good idea! I am going up next week to the cabin and I would be happy to get back to you after I check the ladder. BEST ANSWER: I don't know how well that would work just because the upper hanger. It is not coming off the center of the rod but comes off the top side. Being off center like this would probably cause the doors to hang at an angle because they are not centered under the hanging rod. What is the diameter of the track pole? The horizontal shaft that mounts to the wall is 1.261"OD. Am i able to get the dimentions of the vertical and horizontal brakets, I think I may need to use both in my design? What about from the centre of the mounting holes the centre of the rail mount? I'm assuming the both protrude the same distance out. 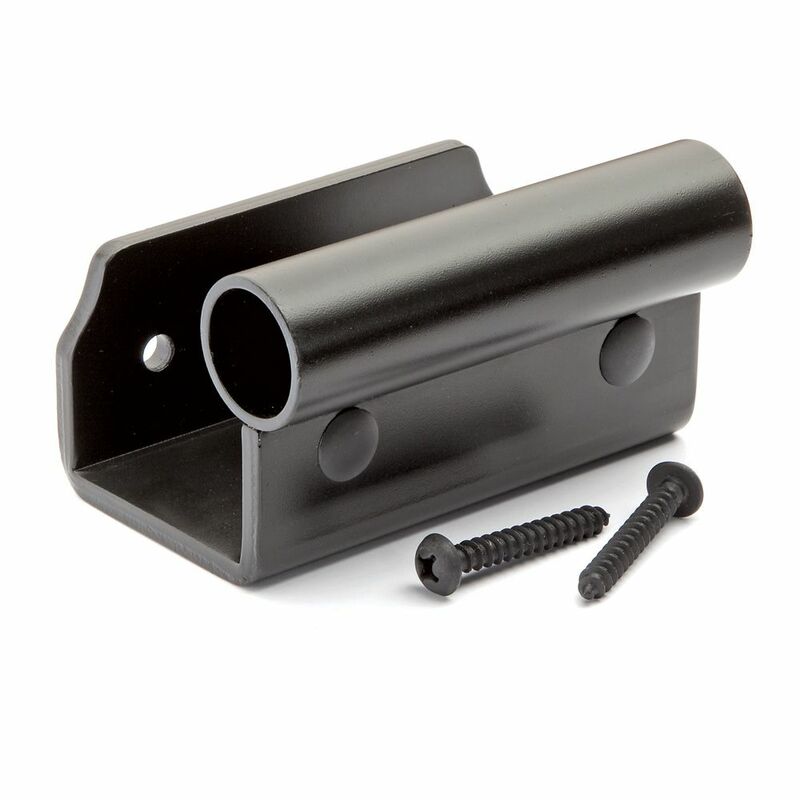 Vertical brackets are 1-1/4" wide x 3-1/4" tall, horizontal brackets are 4" wide x 1-3/4" tall. Can I located a track union and a track bracket at the same location? I have two 6'-0" tracks but would like the bracket to be centered on the run. BEST ANSWER: You should be able to work both the union & the bracket conjoining your 6 feet pieces as the ladder hooks travel over both. Would I need to offset the splice? do the brackets and the unions both occupy the space in the interior of the track? You do not have to offset the splice as they both occupy the interior of the track. I notice in some of the photos that the brackets are mounted to rosettes attached to the shelving. Why is that? Is it necessary? Are shelves with 1” particle-board walls sufficient for supporting the rail? BEST ANSWER: While I am not a structural engineer, it seems that the type of connector is of greater import than the wall. A connector with wings that expand behind the wall is better than nails or screws. These have weight ratings on them, which may be used in conjunction with the known ladder and person weight. I have a 20.5' wall. Can I cantilever the rail, or must the end be secured with a hook? If it must be secured, can I easily cut the rail to my specific length of 20.5'? I don't want to order 18' of rail only to find I need the additional rail. BEST ANSWER: you can cantilever the rail past the last track bracket if that is what you meant. & yes you can cut the rail with a hack saw or metal cutting blade & use a union piece to to fasten the 2 pieces together. Thank you Richard! That is exactly what I meant, and the answer I was hoping for. Can you order additional track for the other side of closet? BEST ANSWER: Yes, I realized I needed a few more brackets too and also decided to do other side of bookshelves later and bought additional parts. I WANT TO BUILD A 7' VERSION CAN THE 8 FOOT JUST B E CUT DOWN? BEST ANSWER: I purchased the hardware and made my own ladder. Length should not be a big issue, as long as you keep the vertical and horizontal dimensions ratio close. I need an additional horizontal bracket to move the ladder to when it is not in use, what parts do I need to purchase (black)? how far does the bottom of the ladder stick out? This system looks great. I want to build a 10' version. I have selected the pre-cut oak wood kit you have. I have also specified the hardware kit. Does it have enough hardware for all the steps, or do I need to buy additional hardware to fix the last few steps? BEST ANSWER: From I know the system come whith all parts. To be a 10 ft. Am a little worried. Is beter if the ladder is more wider. If you need more horizontal screws rockler sell individual pcs if you need more. What is the finish on the rail? Is it simply painted or Powder coated? 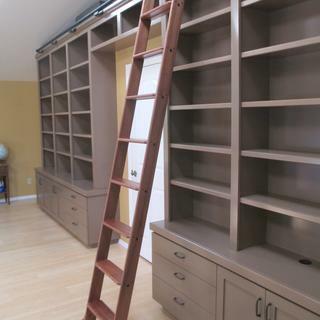 Do you have plans for bookshelves that this ladder can attach to? What is needed to securely support the ladder? am I able to get the vertical and horizontal bracket dimentions as I think I will need to use both in my design?